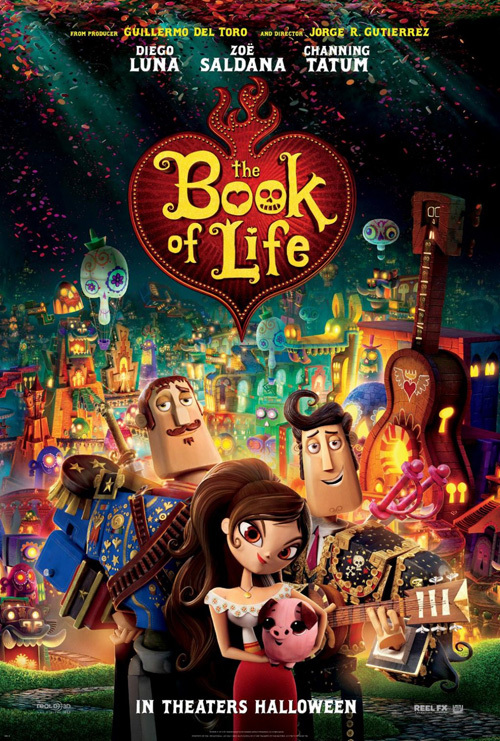 Anything with Guillermo del Toro’s name attached to it is going to be a visual feast, with a little darkness thrown in, and that’s what animated “children’s” movie The Book of Life is all about. But del Toro is the executive producer. This is really the baby of director Jorge R. Gutierrez. And what a baby! What a first baby! His first big feature. A feast, yes. A Mexican feast. Or, Mexican-American. 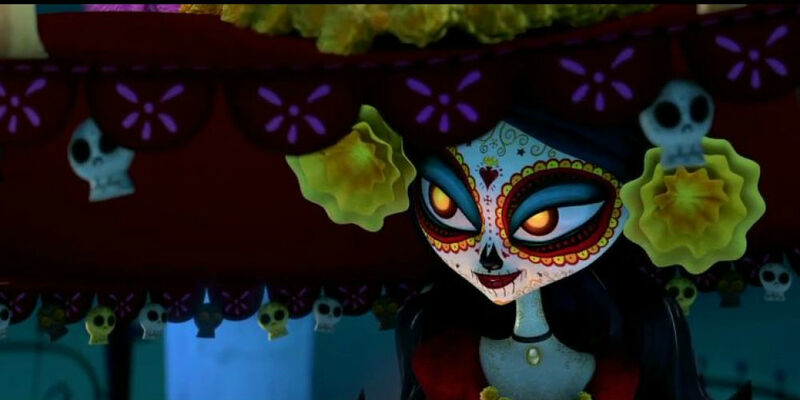 The story (which I’ll get to in a minute) takes place within the myth and folklore of the Mexican holiday The Day of the Dead (El Día de los Muertos) which, despite its name, and as the movie shows, is not funereal, but rather a celebration, a remembrance of family members that have passed on. And memory, remembering and honoring our ancestors, is vital to the holiday, and to the plot. Though yes, there is a little darkness. 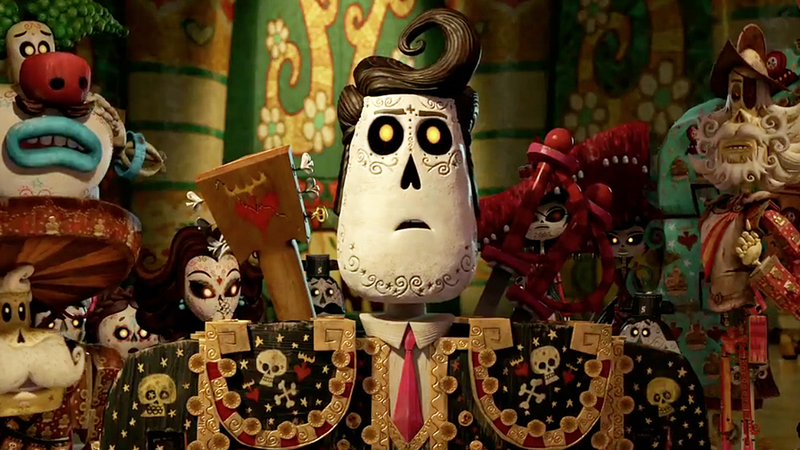 The Day of the Dead may remind americanos of Halloween, with lots of skeletons and ghosts, which may seem a little scary, at least in appearance, especially to the younger audience that this movie is (maybe) going for. But Gutierrez makes sure to give viewers lots of humor, with wild and crazy personalities, along with some out-and-out cute pigs and chickens. But yes, the story: two boys, one girl; guess what’s about to happen? Yes, she’s going to have to choose one, because that’s what girls do. But! The girl, María, who grows up into the mandatory beautiful young woman? She’s not old school. She doesn’t need either boy/man to take care of her because, “By the way, did I tell you I studied fencing?” She can handle herself, and bristles at the old folks, like her dad, who want her to get married for any other reason that love, and/or because she wants to. And yet, despite the girl/woman being self-sufficient, à la Jane Austen, there’s no doubt she’s heading for marriage. And, there’s not really any doubt about which dude she’ll choose—the humanities trump military science. Which, I’m all for. The two boy/men, Manolo and Joaquin have other issues to deal with besides fighting for the attention of María (though they do plenty of that). Each is living under the shadow of his father, and this aspect of the story was more interesting to me, since I, in my forties, am still going through that same thing. But it’s an interesting problem that takes The Book of Life up to a spiritual level: How to honor and remember our ancestors, without living our lives according to their expectations? How do we, as the movie asks, write our own stories? So yes, there is more here than a children’s story. Plenty of Big Questions, along with some insider jokes, for the adults, and plenty of zany cute humor for the kids, though fair warning: a certain six-year-old girl sitting next to me got a little scared at parts. Despite the zany and the fun, there are some huge dark scenes, and huge dark characters. So maybe I’m wrong. Maybe the target audience is actually teens, especially goth teens, like, for example, The Nightmare Before Christmas. The skull imagery is right up their alley. But really, this movie is for everybody, and knowledge of Spanish, and/or Mexico and its folklore, is not required. In fact, you’ll come out of The Book of Life not only entertained, but more knowledgeable. Along the way, the dialogue is spiced with enough Spanish to help give the world a Mexican feel, but not too much. Like Cormac McCarthy’s Border Trilogy books, it’s enough to make us feel the illusion that we too know basic Spanish, with some ‘hola’s’ and ‘m’hijo’s’. The cast of voices include some of my favorites, like Zoe Saldana, the best thing about this summer’s Guardians of the Galaxy, though I fear she’ll now only ever appear in movies with odd-colored skin. Ron Perlman with his low bass-y voice is the perfect villain. And for some comic minor character relief we get Cheech Marin and Danny Trejo, among others. I mention them only because they’re so cool. It’s pretty amazing that Gutierrez has scored so big on his first time out, though I hear through my connections that he’s had the idea The Book of Life for a while. I’m curious what he does next, though I hope he stays with this Mexican-American mix, which is, after all, a huge part of American culture anyways.